Do I have social anxiety? Dealing with a narcissistic boss is tricky, frustrating, confusing, and sometimes even dangerous. Their impulsiveness, tantrums, self-centeredness, and lack of self-reflection often have a profound impact on the company or department they work for, its employees, and can create a tense, hostile, and unsafe working environment. Companies may be fined for ignoring laws, and may even go bankrupt due to impulsive and risky decisions. Employees may develop complex post-traumatic stress disorder (C-PTSD) due to exposure to threats, manipulation, unpredictable behaviour, and tantrums. Fortunately, not every narcissistic boss is the same; there are three types of narcissistic bosses: the malignant narcissist, the vulnerable narcissist, and the exhibitionistic/high functioning narcissist. Each type has its strengths and weaknesses, which we’ll highlight below. how an employee can protect themselves against a narcissistic boss. How to deal with a narcissistic parent? How to deal with a narcissist? Online treatment for narcissism or guidance for those living with a narcissist. Take me to the homepage. At Barends Psychology Practice, treatment is being offered for victims of narcissists. Go to contact us to schedule a first, free of charge, first session. (Depending on your health insurance, treatment may be reimbursed). Before discussing the characteristics of a narcissistic boss, it is important to understand that possessing some narcissistic traits can be really beneficial to a company, and can offer some kind of protection to the employee. High functioning narcissistic bosses, for instance, are achievement oriented, energetic, interpersonally comfortable, very motivated, and tend to show good adaptive functioning . They are more often supportive and friendly to their employees if it serves a higher goal, such as achieving company goals, compared to the malignant or fragile narcissist. Other traits can be positive and negative at the same time. 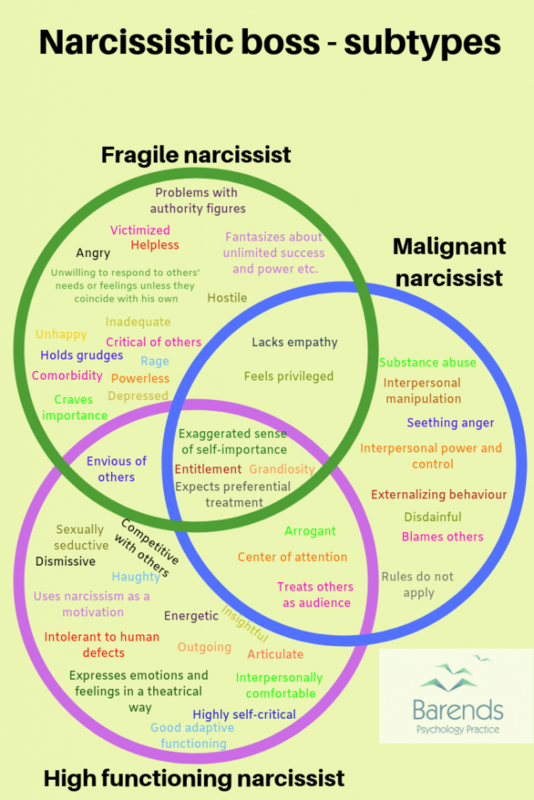 The fragile narcissist, for instance, tends to be highly critical and envious of others. On the one hand, this can push themselves and employees to perform better. On the other hand, however, it can create a hostile and stressful working environment. In other words: having a narcissistic boss does not automatically equal abuse, terror, and suffering. Unfortunately, the narcissistic boss also has a lot of negative traits. 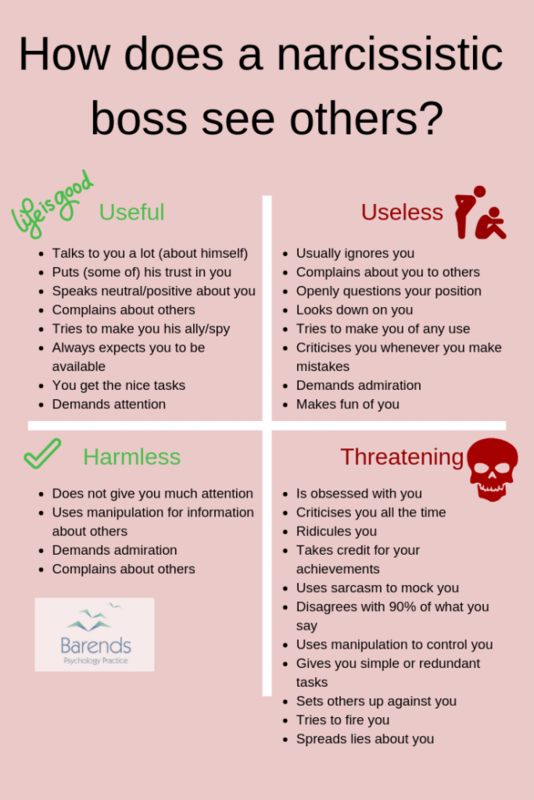 Some of these negative traits can be found in every narcissistic boss, whereas others are specific to the type of narcissist or situation they are in. Arrogance and entitlement, for instance, can be found in every narcissist, but being highly self-critical or feeling powerless can more type specific . In the image above or to the right, you can see behaviours, feelings, and attitudes specific to the narcissistic boss type. The Green circle represents the fragile narcissist, the purple circle the high functioning narcissist, and the blue circle the malignant narcissist. As you can see, some characterstics can be found in two or even three circles. This means that they can be found in two (or three) narcissistic subtypes. It is important to note that some behaviours, attitudes, or feelings specific to a subtype can also be displayed in other subtypes. If this is the case, then it’s usually situation-specific and not a default. An example is ‘blaming others’ in the malignant narcissist, which is normal for them to do. The fragile narcissist, however, can also blame others, but usually only when feelings of inadequacy are being triggered. The fragile narcissist uses it as a defense mechanism, whereas the malignant narcissist usually does not allow feelings of inadequacy to surface: for them it is a manipulation technique. (Advertisement. For more information about narcissistic bosses, continue reading). Based on the lists above, it is clear that the high functioning narcissistic boss possesses the most positive and least negative behaviours, feelings, and traits. They also have a stable work-history, and are less prone to developing other mental disorders, such as depression or social anxiety . 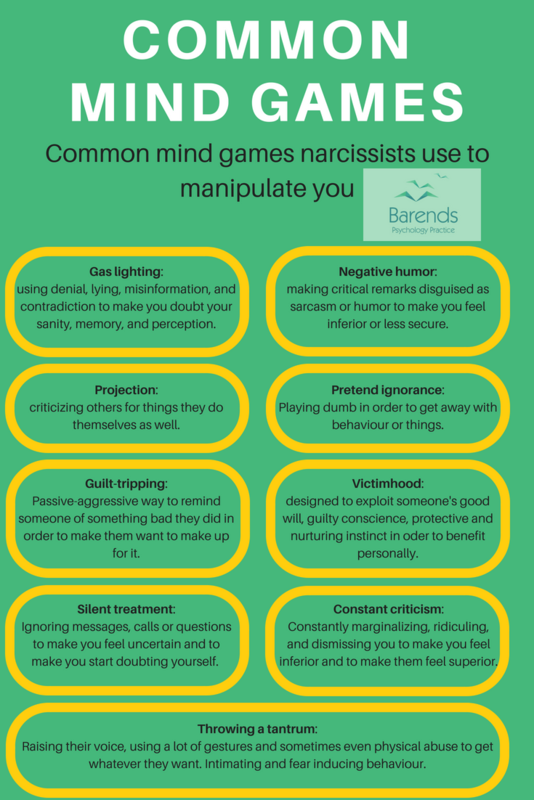 At the same time, it is more difficult to recognize the high functioning narcissists because of these sometimes contradicting signs and behaviours. Usually, they become more narcissistic in their behaviour and thinking during stressful events, when they feel rejected, ignored, when they are disappointed in themselves or others, or when they are envious of others. During these situations, they show more negative signs, such as being dismissive, haughty, self-critical, and more theatrical in their emotions and feelings. They prefer to be the center of attention and, consequently, cannot tolerate someone else being the center of attention. If an employee get’s more attention during a meeting, lunch or party, it is common for the high functioning narcissistic boss to downplay the employees’ achievements, to use sarcasm as disguised criticism, or to feign an illness or injury. The fragile narcissist combines feeling inadequate, victimized, helpless, powerless, and unhappy with jealousy towards other people. To cope with these negative feelings, they feel privileged, entitled to special treatments, and have an exaggerated sense of self-importance. When an employee does not treat them with the respect the narcissistic boss thinks he or she deserves, they can lash out, hold a grudge, and sometimes even become hostile. The fragile narcissist is extremely sensitive to rejection and the slightest sign of rejection will be remembered. Unfortunately, feelings of revenge are difficult for them to shake off, and can result in them bullying or mistreating the person who they feel rejected them for months. Common techniques are gas-lighting, splitting, inducing guilt, and humiliation. Talented employees who could become a threat one day, are usually the ones that suffer the most: they are held back, are assigned to simple or too many tasks, humiliated when they make mistakes, and not given the praise or promotion they should earn. Only when the fragile narcissist needs you, they can accept your talents and treat you respectfully. The malignant narcissist craves for power, control, and attention and will do anything to get what he or she wants. Manipulation, threats, and blaming others are very common for the malignant narcissist. Deep down, the malignant narcissist is very insecure, and will do whatever it takes to not feel this insecurity. They use their narcissism to constantly boost their ego by insulting, humiliating, and blaming others, and by bragging about things they (often have not) achieved. Their inflated sense of self-importance is only a huge mask. Contrary to the fragile narcissist, the malignant narcissist is not sensitive to criticism. They simply ignore it, label it as untrue / fake news, or declare war on you. By attacking someone else, the focus is off the narcissistic boss. In other words, their coping mechanism to deal with criticism is by avoidance and denial. Like the high functioning narcissist, the malignant narcissist needs to be the center of attention. Where the high functioning and the fragile narcissist are envious of others who get (more) attention, the malignant narcissist usually does not feel jealous of others. They simply feel entitled to get all the attention in the world and will not hesitate to throw a tantrum if they do not get what they want. The narcissistic boss has two faces when it comes to the impact they have on the company or department. On the one hand, they can boost production, increase sales, and get far better contracts/business deals than others without narcissistic personality disorder. As long as the company is growing, they are happy and satisfied. Whereas on the other hand, sooner or later their arrogance will become their downfall. When the narcissistic boss is going down, he or she will cause as much damage to others as possible. Many narcissistic bosses are temporarily successful because of their arrogance, stubbornness, lack of empathy, and manipulation techniques. They see the department or company as if it is their own, they identify with it as a mother identifies with a child. Especially in the beginning, they will work a hard and expect the same of their employees. The narcissistic boss will take credit for the growing numbers, increases in sales, and even for personal successes of its employees. During these periods, the narcissist is generous, he wants to share his success with others, and wouldn’t mind giving employees a raise. Their negative narcissistic behaviours only flare up when they feel threatened (not getting enough attention, praise, respect, power or when they are losing control). Fortunately, the positive behaviours are more present: the high functioning narcissist motivates its team, the fragile narcissist is friendly with others and feels comfortable at work, and the malignant narcissist likes to talk about himself. Being successful makes the narcissist overly confident, which is not a problem for as long as there is success. The moment they experience a setback, however, is when things will slowly collapse. This could be a denied promotion, rejected product, missed deal, losing a large sum of money, or simply when they do not increase their sales. All the narcissistic boss wants is control, power, and attention. The arrogance, exaggerated sense of self-importance, and entitlement the narcissist usually feels is being projected on the company/department, which means that they start taking risks, disrespect other departments/companies, and basically start behaving as if they are bigger than they are. Unfortunately, their risky and arrogant behaviour will not result in more control or power. Losing control, power, and not getting the attention they want, is a narcissist’s worst nightmare. Anything that negatively affects one of these three things will trigger a response in the narcissist. The longer it takes for them to regain their lost power, attention or control, the more risky, impulsive, and disrespectful their behaviour is. The typical negative narcissistic traits, behaviours, and feelings will surface, while the positive ones will disappear. Suddenly, they need to find an enemy or someone to blame. This could be another department or company, but it could also be an employee. Temper tantrums, rage, hostility, and haughty behaviour is to be expected at this stage. Be aware: even if the company is doing great, the narcissistic boss could experience a personal setback which can lead to their downfall. Depending on the type of company, their responsibility, and the amount of influence they have on people above them, this downfall could be a slow one or a very quick one. Eventually they will reach a point where they distance themselves from their work and ‘give up’. At this moment, they will only go for personal gain, and may start to abuse their power by throwing expensive parties, spend company money on themselves, disrespect laws and etiquettes, and cause the company even more harm. If they can be fired or if they are to be send home on sick leave, they can turn into unpredictable, raging, and even suicidal people. After all, being fired or send home on sick leave equals humiliation, loss of control, power, and attention. If this is the case, it is important to stay neutral to them. By staying neutral, they will not blame you and may see an ally in you. By turning against them, they will most likely try to get some revenge. Narcissists do not have friends. They see people in terms of ‘useful’ versus ‘useless’ and ‘threatening’ versus ‘harmless’. The narcissistic boss craves power, attention, and control, and anyone who can help achieve these things is useful to him. A harmless person is someone they don’t need to worry about and, at the same time, someone who might be of use in the future. A threatening person is basically anyone who takes away or denies the narcissistic boss power, control or attention. It is possible that a very useful employee suddenly becomes a threat to the narcissist and faces a lot of hostility and mobbing (see image for manipulation and bullying techniques). At the same time, someone who is considered a threat can suddenly become very useful. It’s these sudden shifts that make it difficult for employees to predict how their boss will respond to them or others. Their unpredictability causes a lot of stress and pressure. Each product or task needs to be perfect, and even if a product is perfect, the boss may decide that it needs to be done in a completely different way. They may even demand you to change or adjust things for them during the weekends or in the evening. They absolutely do not respect your boundaries and privacy. It is even common for narcissistic bosses to ask you to run errands for them (picking up a suit, doing grocery shopping, and sometimes even to walk their dog). Another stressful and anxiety provoking aspect about narcissistic bosses is their ever changing mood. One moment they are happy and the next moment they throw a temper tantrum. Remember this: the possibility of losing control, attention or power will provoke a negative reaction in any narcissist. If an experience has a significant impact on someone, it may cause sleeping problems, flash backs, mood swings, stress, concentration problems, and can sometimes even lead to substance abuse (to suppress these memories and feelings). 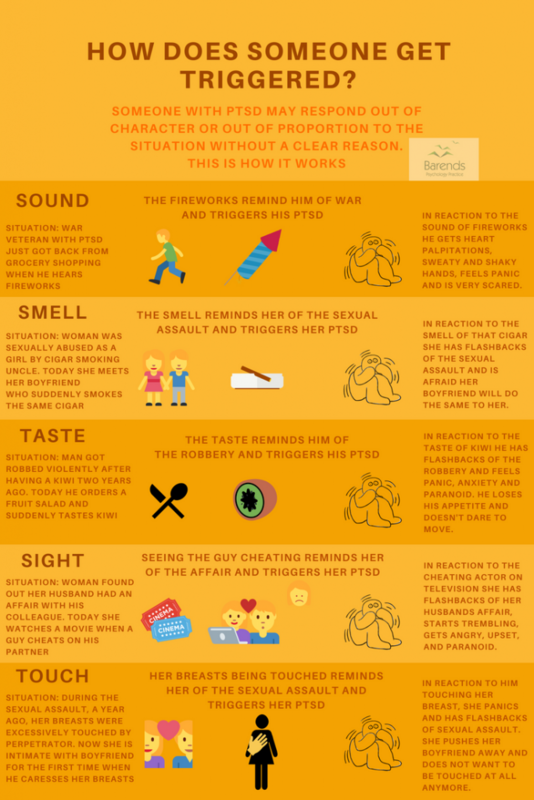 If the experience is not processed correctly and/or if this particular experience may occur again in the near future, this experience can lead to PTSD. PTSD is a normal response of the body to a very stressful situation. If an employee is being humiliated, criticised, picked on, threatened, or ridiculed by a boss or coworkers, they can develop PTSD. Also, when they are being set up or deceived by their boss, an employee can be traumatized: they may lose trust in an authority figure, someone they trusted. Unfortunately, narcissistic bosses tend to do this a lot! If an employee is exposed to longer periods of repeated bullying/mobbing, threats, or huge job insecurity, someone may develop Complex PTSD (C-PTSD). The negative feelings, emotions, and memories related to the C-PTSD and PTSD can be triggered in many ways, and can negatively affect job performance, but also functioning in social and daily life activities . For instance, when the narcissistic boss would often call the employee in the evening for some (minor) tasks. Not answering the phone causes trouble at work the next day, so answering the phone and obeying is the only thing the employee could do. It is possible that this employee becomes afraid of any phone calls in the evening, and eventually to phone calls in general, regardless of the person who is calling. This is a significant stress response that can lead to sleeping problems, worrying, and eventually even social withdrawal (‘what if my boss calls me while I am in the cinema?’). If you recognise this and want to find out whether you have PTSD, please try the online PTSD test. It is also possible to try to reduce some of the PTSD triggers by trying out self-help page for PTSD. Green is healthy person. Orange person has burnout. People may get burnout when they are under a lot of pressure or experience a lot of stress for a long period of time and are unable to recharge enough emotionally and physically. Common symptoms of people with burnout are: feelings of exhaustion, concentration problems, lack of empathy, motivation, and creativity, and cognitive problems . 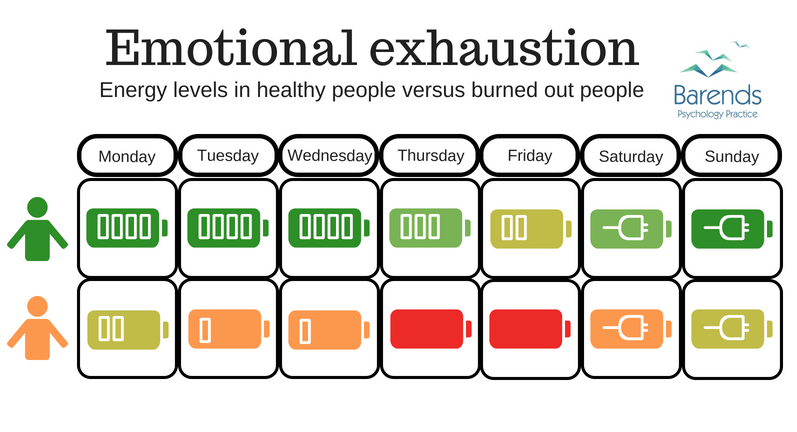 Also people who are burned out more often take sick leave . Narcissistic bosses tend to put a lot of pressure on their employees, because they demand positive results. Their lack of empathy, unwillingness to accept human defects, and difficulty with rejection (saying no, for instance), in combination with their insatiable addiction to power, control, and attention, creates the perfect cocktail for burnout. The narcissistic boss will try anything to make sure the employee does what he wants them to do; from manipulation to threats, and from bullying to neglect. Not being able to perform or not prioritising work or the boss’s demands can cause the boss to be disappointed in the employee. Once the boss is disappointed in someone, they are of no use or even worse, a threat (they may slow him down). In other words: Not obeying the boss can lead high stress levels and a lot of pressure. Often, this negatively affects family and social life. In case you recognise this in yourself, consider these self-help tips to reduce the impact burnout has on you. Panic attacks, panic disorder, social phobia, generalized anxiety disorder, major depressive disorder, and somatic symptom disorder are among the other mental disorders someone may develop whilst working for a narcissistic boss. As mentioned before, the narcissistic boss does not have friends. An employee can be useful, useless, harmless, or a threat. These categories are based on the narcissists’ primary motivations in life: gaining power, control, and attention. Every person they interact with needs to serve one of these purposes. If the employee can’t help the narcissistic boss to become more powerful, attract more attention, or gain more control over situations/people, then that employee is useless in the eyes of the narcissist. This employee could be skilled at his job, but if the narcissist has the feeling that the employee does not want to make an extra effort for for him, then the employee will be considered useless. This employee is an easy target to mob, threat, humiliate, and insult. The narcissistic boss will try to find a way to use the employee, but if this is not possible, then the narcissist may fire or transfer the employee whenever he has the chance. How to get out of this category? (1) Work harder, stand out! (2) Praise your boss, support him during meetings or discussions, praise/thank him if you achieved something on your own. Narcissists are sensitive to these things. (3) Make sure he gains more control over the company/department. (4) Make sure he becomes more powerful (increase sales). (5) We strongly recommend people not to become a spy for the boss. This creates a very unsafe and hostile working environment. What if you can’t get out of this category? (1) He is disappointed in you. If he trusted you once, but you failed to meet his expectations, then it is likely he will not change his opinion on you. Not for a long time, at least. (2) You do not want to work harder, make an extra effort, and you are not willing to praise him. (3) There is something about you that he doesn’t like. This could be the way you dress, your haircut, or the people you hang out with. If this is the case, the best way to cope with your narcissistic boss is by staying neutral during meetings and conversations. Anything you tell your narcissistic boss can (and often will) be used against you. By staying neutral in your opinion on people and topics, your boss is unable to hold it against you. Try to distance yourself emotionally from your job in such a way that his impulsive decisions and changes do not affect you (that much) anymore. The more you invest (emotionally) in your job, the bigger the chance you’ll be disappointed when your boss changes his mind again. Set healthy boundaries. Despite popular believe, narcissists respect boundaries if there are consequences to disrespecting them. These consequences need to take away power, control, or attention in order to be effective. Any employee that helps the narcissist to gain more power, control, or attention, is useful in the eyes of the narcissist. An employee who is less productive than others, but still feeds the narcissist with attention, admiration, control, and power will be favoured over productive employees who do not feed his narcissism. Despite the better treatment from the narcissistic boss, this is a difficult category to be in. To stay in this category, the employee needs to have something the boss is interested in. Unfortunately, it is common for the narcissistic boss to become increasingly more demanding. From correcting a little document in the evening once to having to work in the evening without getting paid extra. Saying no is often not an option for those who want to stay in this category, so the pressure slowly become enormous. If the employee is too good at something or has too much to offer, the narcissist can become jealous (category: threatening), and if the employee has nothing to offer anymore they could be put in the useless or harmless category. Staying in this category is demanding, stressful, and time consuming. Although this is a safe category to be in, not every employee wants to be in this category: it is time consuming, stressful, and demanding. Also, trying to please a narcissist is not the most pleasant thing to do. Deliberately trying to get out of this category may be more tricky than one may think. Disappointing a narcissist could result in feelings of shame in the narcissist, and that increases the risk of being placed in the threatening or useless category). Feeling ashamed is something a narcissist absolutely does not want to feel, so someone needs to be held accountable for this feeling. This means that the employee who made the narcissist feel ashamed needs to be punished. Taking a little more time to finish tasks and to respond to requests/phone calls, is a safe start. It gives the employee more time to recharge and relax. By not being stand-by all the time, the boss’s attention will slowly shift to someone else. A good next step is to not always agree with whatever the boss says. Instead, ask some critical questions (and refrain from disapproval) whenever the boss proposes something or brags about something. A next step is introducing healthy boundaries, one by one. Always come up with an excuse that is acceptable and has nothing to do with the boss. Keep in mind: as long as the employee has something to offer to the narcissistic boss, it is unlikely that the boss will put him in the useless category. An employee that does his job well, does not complain, is available, and supports the boss when needed, is considered to be harmless. The difference between useful and harmless is the degree to which the narcissist can use the employee. A harmless employee is needed (like a secretary or accountant) in the company but not important, does not have a lot of ambitions, and is not important or skilled enough to take too serious when it comes to opinions on important matters. In the eyes of the narcissistic boss, this employee has little to nothing in common with them, and is usually someone who is ‘below their standard’. Gossip and spying around could give this employee a little extra’s in comparison to other employees, but is not recommended. This is a safe category to be in and due to the fact that the narcissistic boss is not interested in them, it is not likely these employees with transfer to another category anytime soon. Why would anyone want to get out of this category? It’s the safest category to be in. For those who do want to become useful to the narcissist, we recommend following the same advice as we gave in the useless category. Any employee that is more skilled, ambitious, attractive, like-able, intelligent, successful, or charismatic than the narcissistic boss (through the eyes of the boss), is considered a threat. Also, employees who try to take over certain important positions/task or who show interest in doing so, are considered a threat. The problem is that there is no real measure for this, other than whatever the narcissistic boss thinks and feels. It is common for useful employees to become a threat sooner or later. Employees in this category will suffer the most. The narcissistic boss will use any moment to insult or humiliate this employee, to make up lies and to blame them for whatever he feels like he can blame them for. Boss: “If even Mike understands this, it must have been very, very well explained”. Boss: “Well, you are not the smartest in the room, which is an understatement”. — this is the point where it becomes uncomfortable for the boss. He may try to laugh it off or try to deflect, so it is important to focus on how it makes him feel. At the same time, let the boss know that this comment is not appreciated. Repeat this strategy a couple of times. The best way to get out of this category is to work hard and to take away anything that feels threatening to the boss. Only when this employee is not a threat anymore, the narcissistic boss will loosen up. The problem for the employees in this category is that the narcissist always needs an enemy. One effective strategy is to help shift the narcissist’s attention to someone else. Narcissists usually obsess over their enemies, and each new enemy gets a significant amount of attention. Ideally, this is another company or department. Other things someone in this category can do: gaining control or power (knowledge is power) by having anything that the narcissistic boss wants or needs. They may still criticize and ridicule the employee in this category, but less frequent and less severe. It is even possible for the narcissist to move you to the useful category. How to protect yourself against the narcissistic boss? Protecting oneself against a narcissistic boss is difficult and risky. Apart from the fear of being fired, narcissists do not shy away from using threats and scare tactics if someone opposes them. It is common for a narcissistic boss to threaten to fire someone or to take away certain tasks and privileges if the employee does not promise to be loyal to the boss or refuses to do certain things. A common response to these threats is to swallow it, to be silent and obey. Opposing their boss does not cross their mind. They feel powerless. However, there are a couple of things that can be done. Communicate almost everything through email or text. After each conversation with the boss, send him an email with a summary of the conversation and ask him to confirm. Collecting evidence is important to make sure he cannot twist facts or deny agreements, and to make sure he cannot falsely accuse you of something. Back up the text messages and emails on two different USB-sticks. By backing up text messages and emails you prevent them from being deleted all of a sudden. Record conversations or phone calls if needed. Collect as much evidence as possible. Every threat is in your advantage. If your boss is trying to threaten you indirectly, then play dumb and ask him what he is trying to say. By directely threatening you, you stand a better chance in court. Refrain from sharing private information. The only reason a narcissistic boss wants to know about private information, is to see whether it can be used against the employee sooner or later. An example to illustrate this: letting your boss know that you are really tired these days, could result in being taken off that great business trip or project, or could result in extra work. Letting your boss know that you are full of energy will most likely result in more work (because you are so rested these days) and more criticism as well (apparently, you are not working hard enough). Do not engage in gossip, and refrain from judging/criticizing coworkers in front of the boss. Sooner or later this can be held against the employee. To be able to stand up against you boss, you need support from others. If you are the only complaining employee, it is his word against yours. On top of that, he will take revenge. That is why it is important to gather support among other employees. Do not expect too much from the start, because people are afraid to lose their jobs. By questioning some of your boss’s behaviours and comments, it is more likely that others will notice these things and agree with you. Don’t do this in front of you boss, of course. People will see patterns and be happy to notice others see this as well. Do not immediately call for action. Take it slow. Collect evidence and be sure that you have their support when needed. Try to set healthy boundaries as a team. Make sure there is not just one leader, because the narcissistic boss will try to eliminate the leader immediately. As a team, you are stronger and by switching leaders often enough it is more difficult for the narcissitic boss to do something about it. Introduce consequences to disrespecting boundaries and base these on the things your boss craves for the most: attention, power, and control. As a team, defend each other when the boss tries to humiliate, insult or threaten someone. Your boss will adapt sooner when he faces a team. If this does not result in any changes, turn to the higher boss and present him your evidence. Again, act as a team. This will backfire a little bit, but that is only temporary. Your boss need a framework and the higher boss can offer him this. Russ, E., Shedler, J., Bradley, R., & Westen, D. (2008). Refining the construct of narcissistic personality disorder: Diagnostic criteria and subtypes. American Journal of Psychiatry, 165, 1473-1481. Karney, B. R., Ramchand, R., Osilla, K. C., Caldarone, L. B., & Burns, R. M. (2008). Predicting the immediate and long-term consequences of post-traumatic stress disorder, depression, and traumatic brain injury in veterans of Operation Enduring Freedom and Operation Iraqi Freedom. Invisible wounds of war, 119. Gorter, R., Freeman, R., Hammen, S., Murtomaa, H., Blinkhorn, A., & Humphris G. (2008). Psychological stress and health in undergraduate dental students: fifth year outcomes compared with first year baseline results from five European dental schools. Eur J Dent Educ., 12, 61–68. Schaufeli, W. B., Bakker, A. B., & Van Rhenen, W. (2009). How changes in job demands and resources predict burnout, work engagement, and sickness absenteeism. Journal of Organizational Behavior: The International Journal of Industrial, Occupational and Organizational Psychology and Behavior, 30, 893-917. Barends Psychology Practice offers online expat counseling, couples counseling, and family counseling for mental issues, and personal development for individuals, couples, and families. © Barends Psychology Practice. All rights reserved.